Academic group of the ERASMUS + project “MoPED – Modernization of Pedagogical Higher Education by Innovative Teaching Instruments” conducted a series of informational meetings-presentations and trainings for university students and professors according to the results of study visits to the University of Deusto (Spain) and Krakow Mining and Metallurgical Academy (Republic of Poland) during April-May. In particular, an informational meeting-presentation of the project took place at the Department of Professional Education and Innovative Technologies within the framework of the scientific and methodical seminar “New Ukrainian School and the System of Postgraduate Pedagogical Education” for magistrates of the “Primary Education” specialty. The head of the project’s academic group, Professor Olena Budnyk, introduced the present to the main tasks and expected results of the project. She also outlined the instruments for e-learning and the ways of forming media literacy of university and secondary school students. During the meeting considerable attention was paid to the problem of forming the information and communication culture of students. 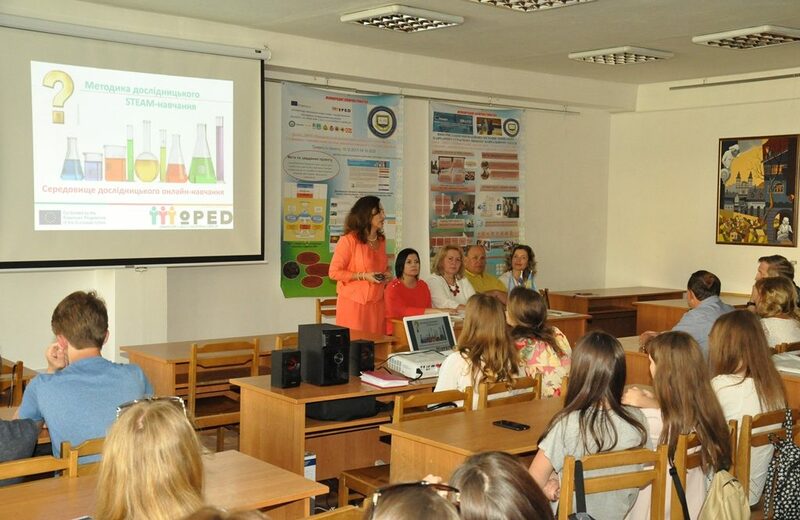 Assistant professor Tetyana Blyzniuk conducted an informational meeting-training for teachers of the Department of Pedagogy of Elementary Education. She presented the teachers and the students with the recommendations for creating new training courses through the prism of the personality of a modern student. Tetyana Blyzniuk also conducted a training session, during which the participants of the event worked on creating the portrait of a student of the 21st century. Member of the project’s academic group, assistant professor Inna Chervinska, presented the colleagues with a model of mixed learning in a modern institution of higher education. She shared the practical experience of using e-Learning while teaching the Didactics course. During the informational meeting that took place on May 29 in Bohdan Havrylyshyn Reading-Room in the Scientific Library of our university, the participants were presented innovative technologies for online research on teaching STEAM subjects at a secondary school, as well as acquainted with the research environments in the Ukrainian language (ILS), created by university lecturers and magistrates within the framework of the project (http://www.golabz.eu/spaces). Present authors of the created ILS (Professor Olena Budnyk, Associate Professor Tetiana Blyzniuk, Teacher-Methodist Serhiy Mykytsey, Graduates Snizhana Nehruk and Liliana Klius, magistrates Olha Boichuk, Iryna Zaharovska, Liliana Poberezhnyk, etc.) talked about the benefits and difficulties in creating and practical use of the developed electronic learning instruments, and also demonstrated the ways of their practical application in the pedagogical process of the New Ukrainian School. As a result of the discussion, the students expressed their desire to continue to actively participate in the development of innovative e-Learning instruments for children and young people. At the end of the event, the participants who have joined the creation of an innovative research environment for online learning have been awarded certificates.